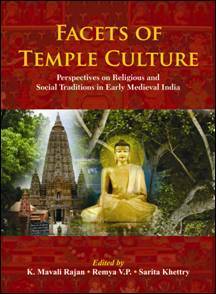 This book consists of twenty three research papers; afford a welcome enlargement of the scope of the religious, social and architectural discourse, which dealt with the some of the important issues like order of hierarchy in the realm of religions, religious patronage and reciprocity, temple-society interface, facets of temple culture and Buddhism and its cultural phase and other issues of the early medieval India. The importance of the publication of this book lies in the fact that it would not only help the academic world but also all those who are interested in the understanding of the early medieval temple, religion and society. Towards a fuller understanding of the religion and society in early medieval India, the present volume contributes in an enormous way and we hope that this will stimulate further research in the field of cultural and social history of early medieval India. The strength of this edited volume spotlight on the wide range of aspects on the subject as well as projections of the learned scholars on the theme of this book. It is hoped that the readers would be immensely benefitted from the learned exposition of social hierarchy in the realm of religion and society during the early medieval period of Indian history.